Signed lower left, J. Eliot Enneking. Joseph Eliot Enneking, American. (1881-1942). 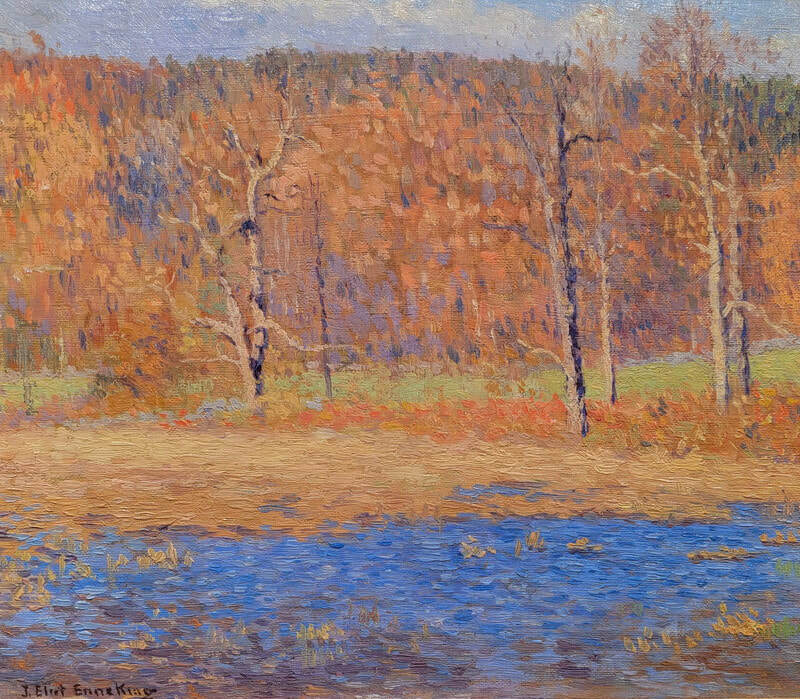 ​​Impressionist landscape painter Joseph Eliot Enneking (1881-1942) was born in Hyde Park, Massachusetts, the son of John Joseph Enneking (1841-1916), also an Impressionist landscape painter. He studied at the Boston Museum School with Joseph De Camp (1858-1923), Frank Weston Benson (1862-1951) and Edmond Charles Tarbell (1862-1938). Enneking then opened a studio in Brookline, Massachusetts, not far from Boston, painting around Mill Pond, a quiet wildlife refuge. He also painted beach scenes, paths through woods, and the light at sunset in Rockport and Gloucester, Massachusetts, where this scene was painted. Enneking was a member of the Rockport Art Association, the Copley Society, the North Shore Art Association, the Salmagundi Club, and the New Haven Paint and Clay Club. In addition to the New Haven and Boston clubs, he also exhibited at the Corcoran Gallery and the Pennsylvania Academy of Fine Arts. Where his father often explored the light at dusk and similarly moody landscapes, the younger Enneking preferred the bright, sun-dappled canvases favored by many American Impressionists. His work can be seen in the Springville Art Museum, Utah; the Mystic Art Association, Connecticut; and the Cape Cod Museum of Art in Massachusetts. An additional painting by Joseph Eliot Enneking Ten Pound Island is currently also available.